We help children and young people in Moray who may be struggling with their emotions and behaviour, prompting concerns about their well-being. Our team is there for children and young people who need extra support. They may be at risk of being excluded from school. They may be struggling with their emotions and feel they have no-one to turn to for help. Some might have a chaotic home life, where family members may be misusing drug and alcohol. This part of the service is known as an intensive community support service. Our young people’s workers provide one-to-one help for our children and young people, in a safe and relaxed setting. They help them to understand the issues that are affecting them, that can sometimes be the cause of their behaviour. They help them take steps to overcoming their difficulties at home, school and in the community. The team also work with other family members, parents and carers to improve relationships at home. The team at Aberlour Youthpoint – Moray understands that when children and young people have to deal with difficult circumstances at home or at school, it can lead to complex feelings. Our staff are sensitive, compassionate and build positive, constructive relationships with young people and families. Aberlour Youthpoint – Moray also offers a mentoring service which matches trained and committed volunteers with young people who would benefit from extra support. This may be because they are struggling to make and sustain friendships and are at risk of becoming socially excluded. Or it may be that they are experiencing other difficulties in their life. Our mentors give them someone to talk to about their worries, and practice social skills with. 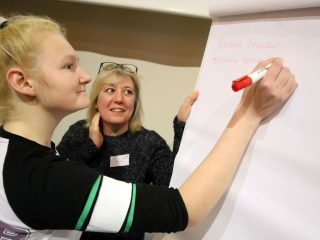 For some young people, a mentor offers a great way to boost their confidence and help them develop employability skills after they have left school. The mentoring service supports young people aged 12-25. Referrals to our mentoring service can be made by anyone and we regularly receive requests from teachers, social workers, police, housing staff, parents and young people themselves. Requests for support from the intensive community support service can only be made by the Social Work department. If you would like to refer a child or young person to us for help, contact us.